After going 13-3 in 2016, the Dallas Cowboys took somewhat of an unexpected step back this past season, as quarterback Dak Prescott experienced regression following his outstanding rookie campaign and his surrounding cast followed suit. Star running back Ezekiel Elliott saw his impact falter as he served a six-game suspension, and the previously dominant Dallas offensive line struggled through injuries and overall regression in some areas. Defensively, Dallas struck gold in breakout edge defender DeMarcus Lawrence, as he put forth an impressive performance rushing the passer to save a Cowboys defensive line without much other pass-rushing talent and aid the team’s young, rebuilding secondary. Starting with re-signing Lawrence, Cowboys general manager Jerry Jones should look to build on his improving defense and better equip Prescott with weapons on the offensive side of the ball this offseason. 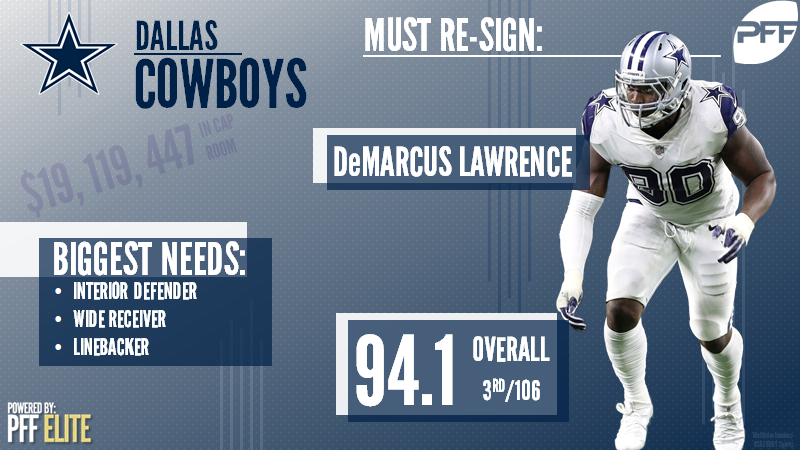 As previously hinted at, Jones’ top priority this offseason should be keeping Lawrence in the building, whether it be signing him to a long-term deal or applying the franchise tag. The 25-year-old Boise State product exploded onto the NFL scene in 2017, as he led all qualifying edge defenders in pass-rush productivity at 14.8, recording 79 total pressures (52 hurries, 12 quarterback hits, 15 sacks) on his 425 pass-rush snaps. Lawrence also mustered a career-high 94.1 overall grade, ranking third among all qualifying edge defenders. The only question about Lawrence is his ability to repeat that performance, which makes him a prime candidate for a franchise tag this year. Playing just three offensive snaps before going down with a torn ACL in 2017, Robinson will surely look to resurface his previously dominant self and rebound next season, and he very likely may do so with a team other than the Jaguars. Jacksonville currently ranks 24th in the NFL in available cap space, and if they choose to pay quarterback Blake Bortles the $19M he’s due in 2018, Robinson could be become the odd man out. As such, Robinson’s future could run through Dallas, as Cowboys’ Dez Bryant has been rumored to be a cap casualty this offseason with the $16.5M he’s due in 2018 and the talent behind him is nothing to call home about. Robinson could step into Bryant’s shoes as Prescott’s top target and, if he can tap back into his 2015 prowess, perhaps outperform Bryant on a cheaper deal. The four-year Penn State product (24 years old) ranked ninth in passer rating when targeted (105.4) and 10th in yards per route run (2.17) among wide receivers with at least 100 targets in 2015, leading to his career-high 87.5 overall grade. In his first two years with the New York Jets, interior defender Sheldon Richardson looked as if he’d become one of the best to ever do it at the position, with 85.0-plus overall grades and 60-plus ‘impact plays’ (total pressures + defensive stops) in each of his first two seasons. However, his regression in his third year has been the level of play that has stuck over his last three seasons in the NFL, including his one-year stint with the Seattle Seahawks this past season. In Seattle, Richardson settled into the middle of the pack in terms of both rushing the passer and defending the run, giving him an 83.8 overall grade. He ranked 21st in pass-rush productivity (7.5) and 30th in run-stop percentage (8.7). While he may not be the game-changing player he once was, Richardson’s consistent play in the trenches could fit the bill for a Dallas team in need of a dose of consistency on the interior of the defense. Of course, there are NFL offensive lines in worse shape than that of the Cowboys, but inefficiencies at two positions specifically (left guard and right tackle) cost what was previously an impenetrable five-man force. Fourth-year veteran Jonathan Cooper continued to struggle despite being surrounded by elite-level talent in Tyron Smith and Travis Frederick, while La’el Collins put together his third consecutive season with a sub-55.0 overall grade as the team’s starting right tackle. Adding a versatile piece to the offensive line in New York Giants’ Justin Pugh as a fill-in starter at guard or tackle would give Dallas valuable depth and perhaps enough competition to push Cooper or Collins off of the first line. If it weren’t for multiple lingering injuries in 2017, Pugh may have avoided his down year (52.4 overall grade), but he has proven to be quite good when healthy, as evidenced by his 78.0-plus overall grades in his first four years in the league.